I haven’t heard of BY WATER’S EDGE. It sounds lovely. I’ll add it to my wish list. Thanks for sharing it, Monica! lkd, wish hard! This one will be difficult to find. Artistry in words & watercolor. Thank you for sharing Janet Wong’s lines. 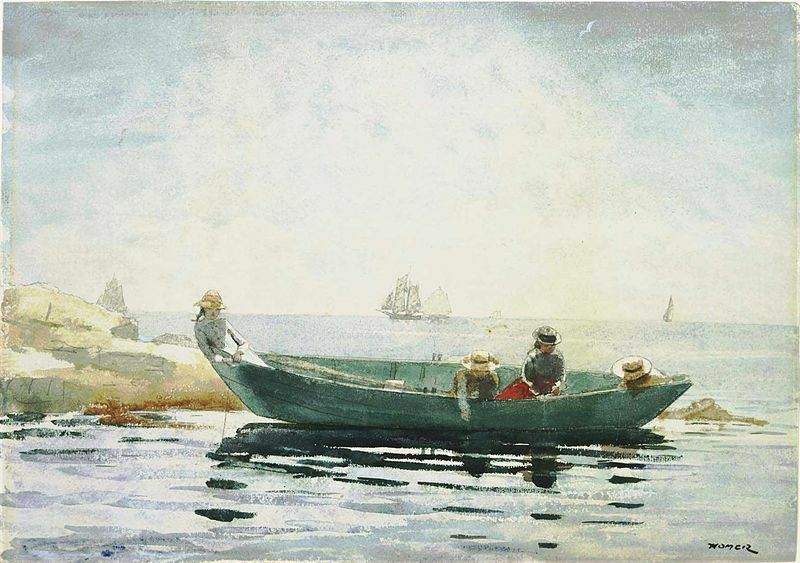 Winslow Homer is an artist I turn too for moments of joy, with a close feeling to scenes, because he also found inspiration along atmospheric waterways in Florida where I have traveled. I see his pieces in North FL museums & am taken by their transcendence. I didn’t know about Janet Wong’s children’s poems paired with Winslow art for the Boston MFA (which has two special connections for me) so triply joyful about this. Thank you Monica I’m lucky to find cartwheels & you this post through Poetry Friday. Hi bookseedstudio, thank you for visiting. I’m sorry my post was confusing – the author of “By Water’s Edge” is Kay Barone, not Janet Wong. I’ll update the post so that is more clear. Monica, I’m the fuzz-brain. Why didn’t i see what you state clearly above the first lovely watercolor. And, it’s a lovely post with Kay Barone’s lines. She is a new poet to me so I appreciate learning a name to look up. Thank you for your lovely response, you are kind. 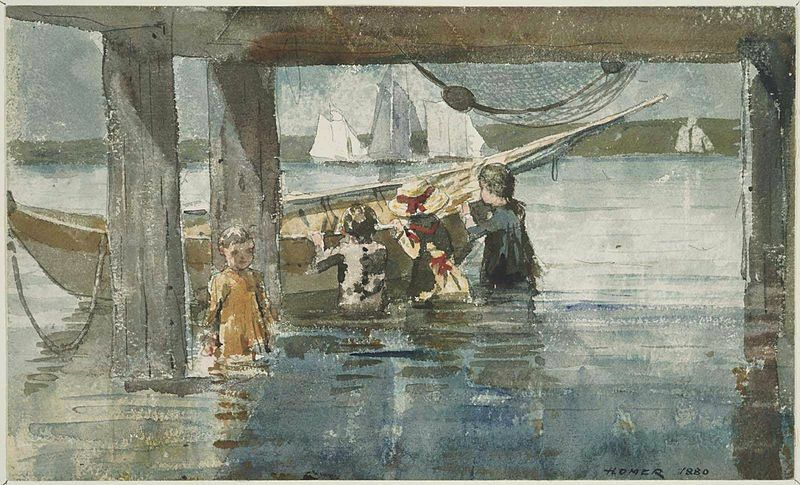 Monica – this does look and sound like a wonderful book and brings back fond memories of my years in Cambridge, visiting the MFA and viewing Winslow Homer’s works. Sigh. What a find, Monica! Beautiful. I did see a few copies on Amazon, but not many at all. Hi, Bridget. You’re right, we might as well be optimistic! What a beautiful book! It looks like it will be worth the search. Thanks so much for sharing! Thanks for bringing attention to our Poetry Friday post, Monica–and for your own post about this exquisite book! Janet, the Celebration Anthology sounds great! We’re tuned! :) Thanks for visiting and sharing your thoughts. Looks like a treasure. I wonder if it will come back in print? Tabatha, out of all the libraries in our regional system, my library was the only one that owned a copy. So I don’t think it was a book that was widely received on the first printing. Thanks for stopping by! Loved your hope poem. Homer’s works are so tranquil — I could study them for hours. Thanks for sharing this treasure. I’ll be on the look-out! Homer’s watercolors are a perfect pairing for those lines. What beautiful artwork.